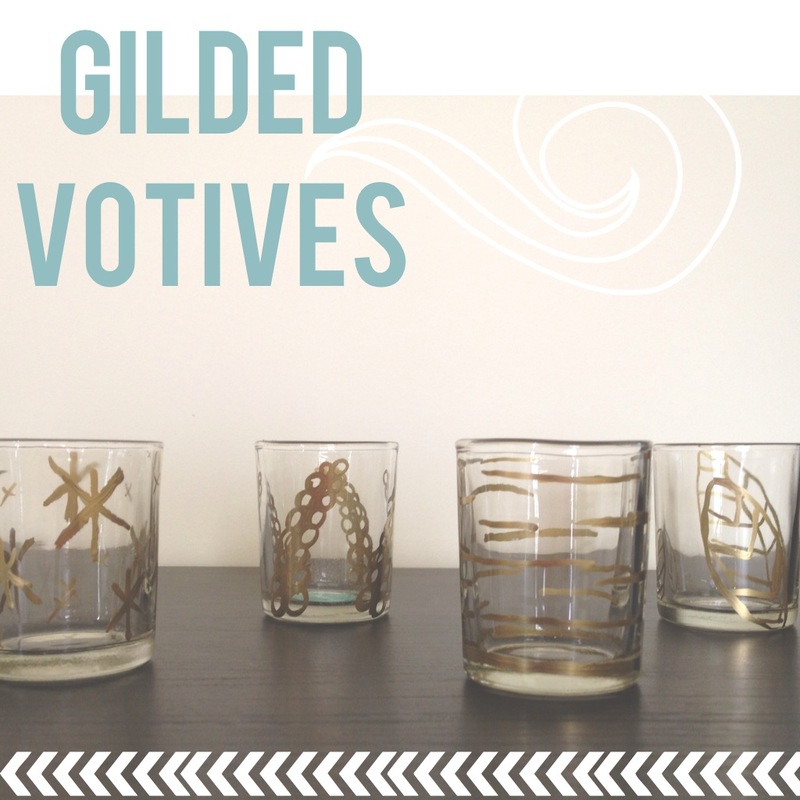 In my Gilded Votives kit, I received 4 clear glass votives, a small can of gold spray paint, gold glitter, a gold 2.0mm Pen-Touch paint pen, and a paintbrush. Truth be told, the paintbrush looked like it’d seen better days. Instead of jumping right in, as is my usual style, I decided to sketch out some embellishing ideas so I could decide on a “collection” theme for my votives. 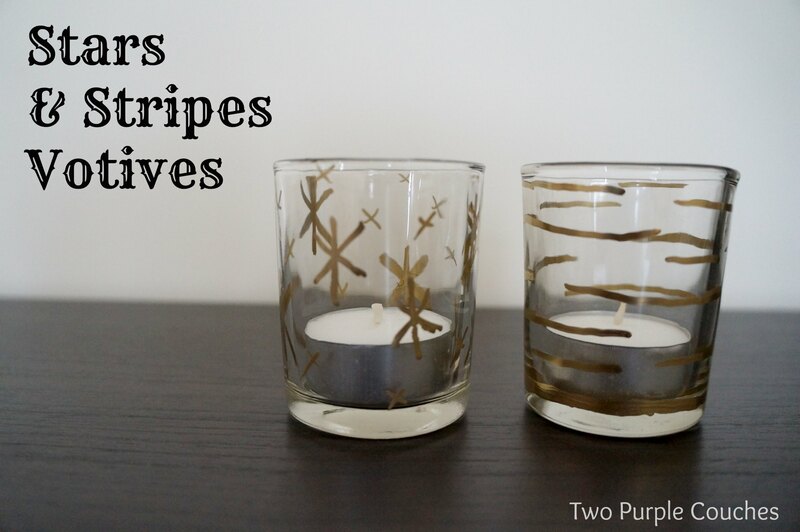 I decided on stripes, and kicked off my crafting time with the Pen-Touch paint pen and the first votive holder. It was super easy to draw the uneven stripes on. I mean, we’re talking like a 2-minute crafting time. Then I thought I’d get fancy with Mod Podge (not included; though I thought it would be) and the gold glitter. Di. Sas. Ter. I tried to paint a solid stripe around the center of the votive and roll it in glitter. Wasn’t loving it, so then I thought I’d coat the whole votive in glitter. This is where things started looking like preschool craft hour. Glitter, glue, everywhere. Wonky looking votive. So… I washed it all off and decided to stick to the gold paint pen to finish things out. I would’ve loved to try the gold spray paint, but the thought of taping off stripes or other patterns was more than I was in the mood for. The great thing about this craft is that it can be super quick if you want it to be. Anyone else like that? Some days you’re in it for the long haul, blocking off hours to devote to your glue gun or painter’s tape and bottles of Krylon. Others, you want to get in ‘n get out, with minimal mess. This was one of those crafting days for me. and the other is “Nature-Inspired” with leaves and something that resembles some flowers on my deck. 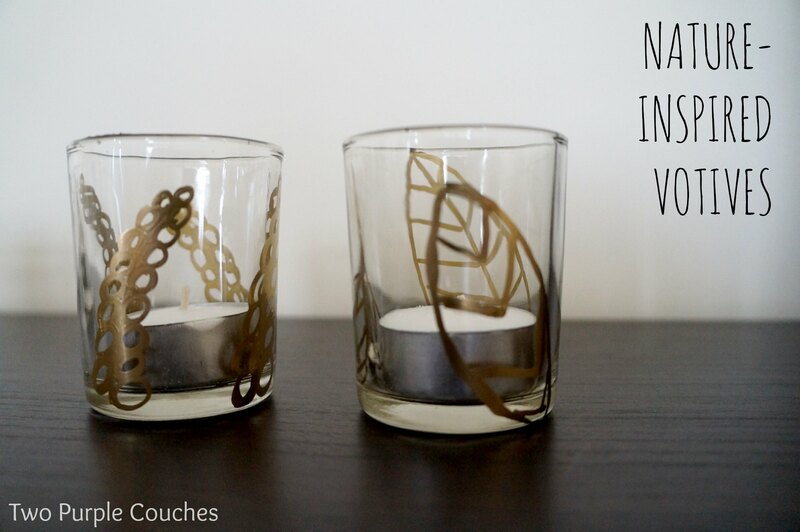 You can find Ez’s original Gilded Votives diy on Creature Comforts here. 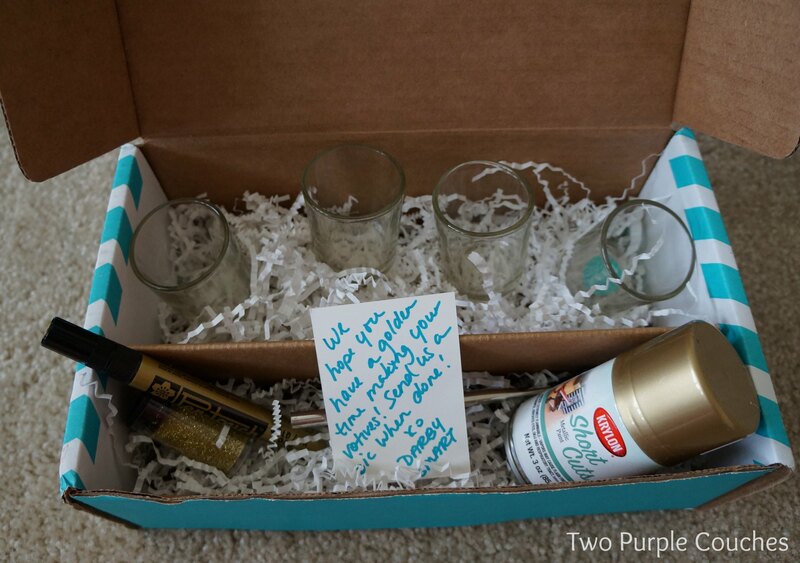 Awwww, thank you so much Ez! This means a ton coming from the original artist and creator! I wasn’t upset about the brush and the mod podge because I have plenty of brushes and a rather large bottle of mod podge on hand, but I know not everyone does. Hopefully mine was just a fluke! 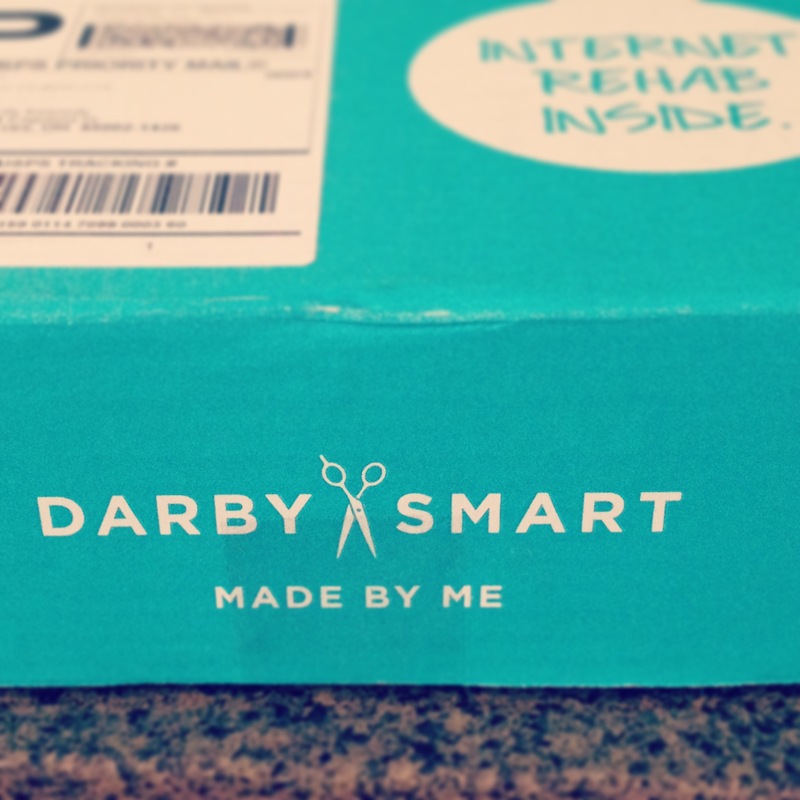 Thank you again for reading my post & checking out my project!